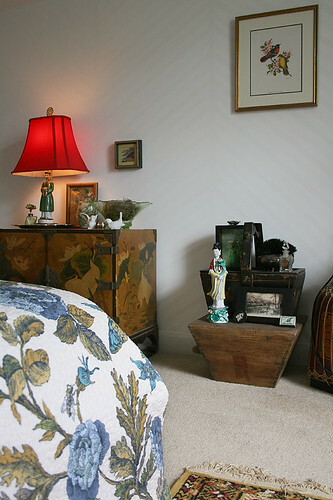 Navigation: Home » home is where the heart is » bedroom » The great cover up. Not bad for $125 including the quilt, two king shams, and a gorgeous sheet set…which I now need to wash. 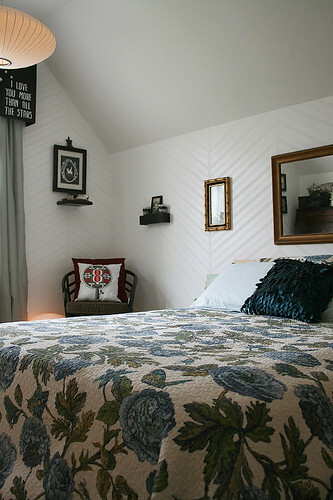 I definitely like this quilt in the space better than the Laelia quilt (which I also love – Anthropologie has gorgeous bedding that I swoon and pine over, like Pavo– but I think Laelia might be a little bit too graphically edgy for the sophisticated element of the room). 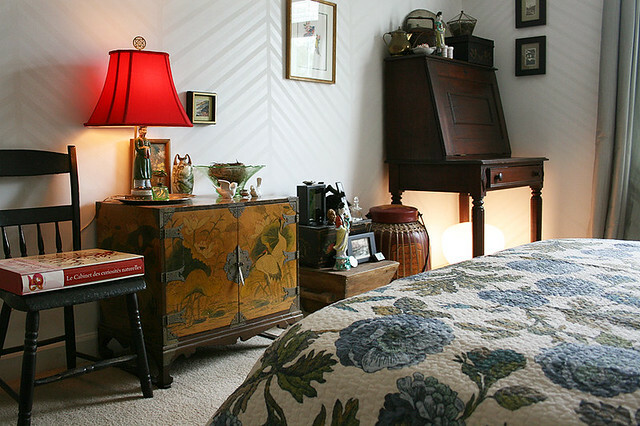 The HomeGoods might compete/clash a bit with the red, but I do love it, and it certainly fits the feel of the space better than the brown quilt. Have you seen this? 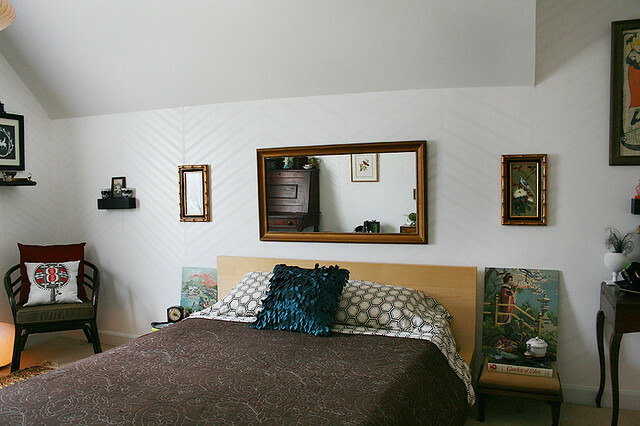 I wouldn’t have thought of going with a dark quilt in your bedroom but it’s really lovely and has the bold side that Laelia does, yet a bit of an Asian influence. I saw the Pavo quilt during my search and immediately thought of you! 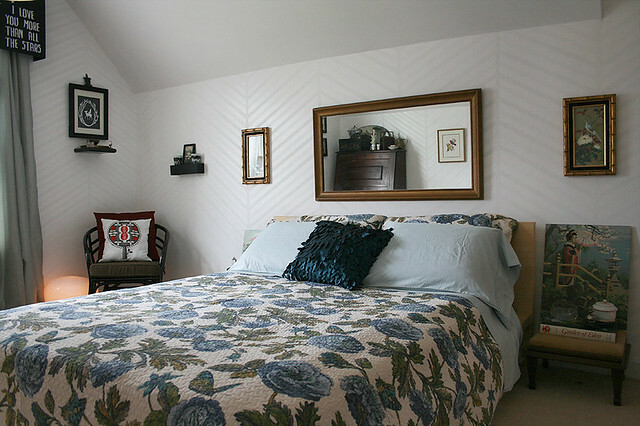 I did look on UO but don’t recall seeing that quilt, and you’re right it is lovely! I’m going to keep an eye on it and see if it goes on sale down the road. I also checked eBay for Laelia quilts but they were still kind of high. Michael and I have talked about removing/changing the red elements out of the space. Take the lamp shade…I’ve always wanted to cover one and this could be the opportunity to teach myself and make a new tutorial. We’ve also talked about repainting the Chat Noir in shades of white and green, and the pillows can certainly be moved to other areas. The remaining red would be just fine. Hey, I also noticed last night that my ‘follow all’ button on your Pinterest never went through and all that time I was wondering why I never saw anything from you! 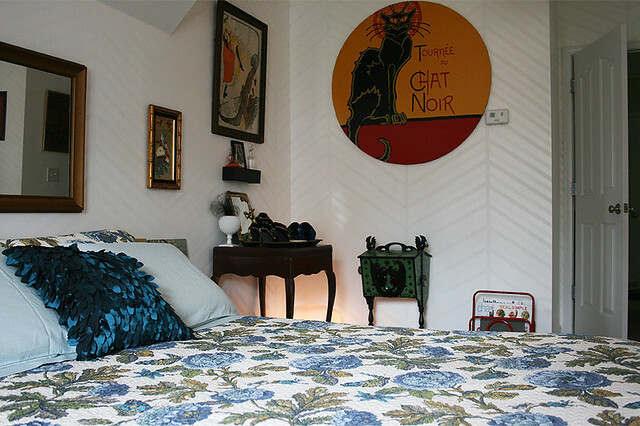 I agree with you about the lampshade and the Chat Noir… the current quilt looks perfect with all of the other items, it is those two elements that throw it off a bit. I think that’s one of the Pinterest quirks! I get emails about people following me all the time who I thought were already following me. I tried to write something sassy on your wall, but it wasn’t having it yesterday. 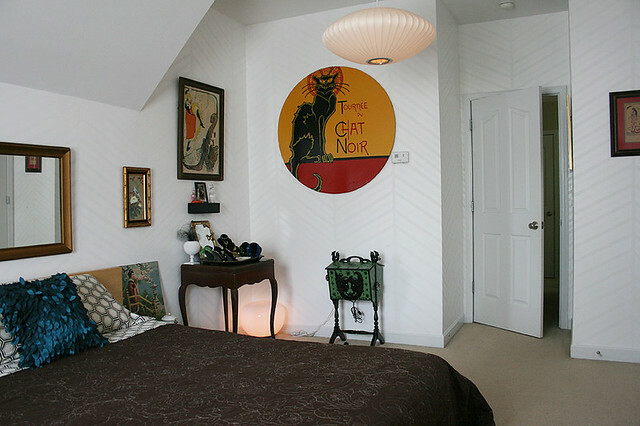 Talking more with Michael, we’ve decided to paint another poster and hang it there, and leave the Chat Noir be. There’s too much sentiment attached to it right now.